If you have an online store, hosting a giveaway on your website is a great way to get the word out about your brand, get more subscribers on your email list and get more followers on your social media accounts. Maybe you just launched your website or have a new product line to promote – hosting a giveaway is the perfect way to market it. When I was running Crafty Pie, I hosted a number of giveaways. 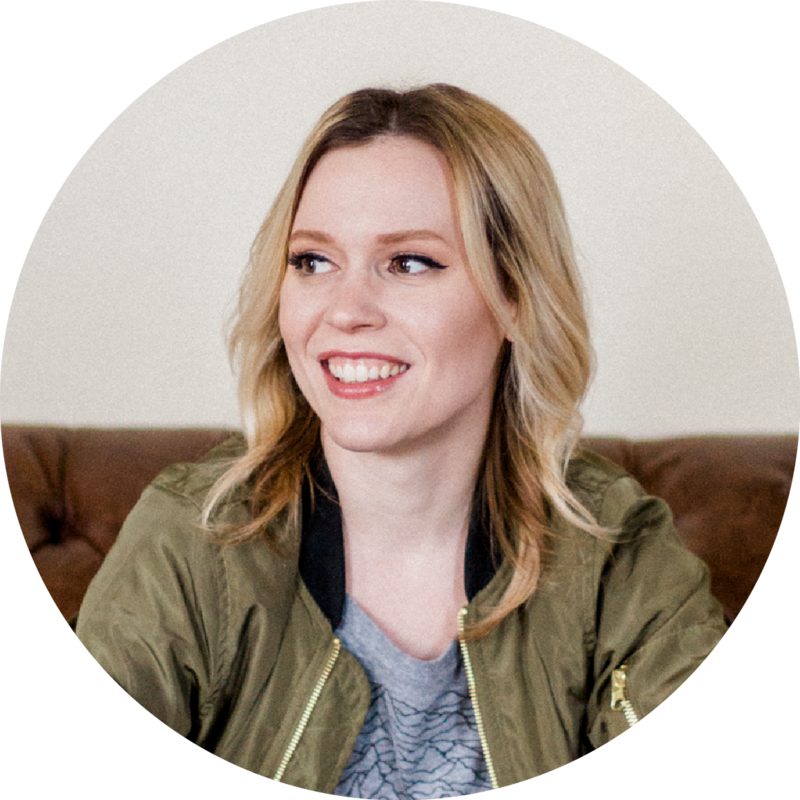 Sometimes they were hosted directly on the website and sometimes I partnered up with bloggers in my niche to leverage their existing audience. I learned a lot about what works and what doesn’t when hosting a giveaway. 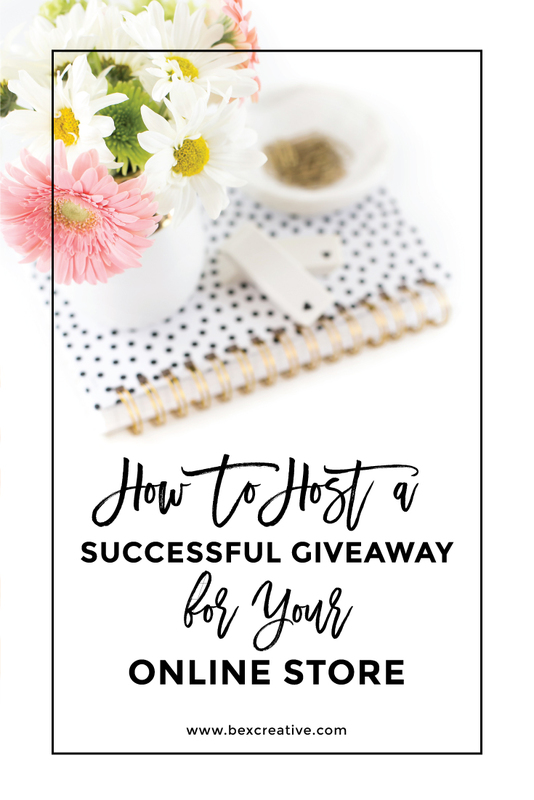 If you want to learn how to host a successful giveaway for your online store, continue reading this post – I’ll be sharing everything I learned. 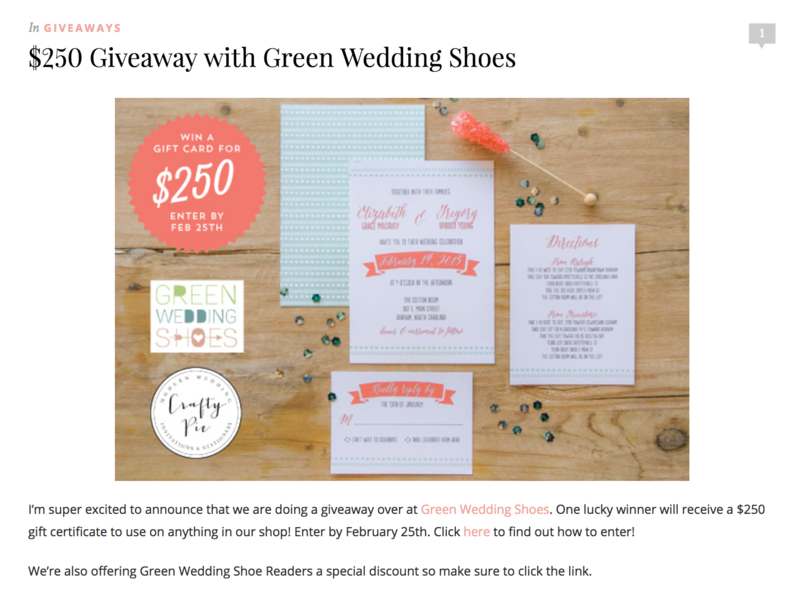 As I mentioned above, when hosting a giveaway, I would sometimes host directly on my own website, and would sometimes partner up with a wedding blogger. There are pros and cons to both of these methods. If you’re hosting a giveaway on your own website, you have more control over how the participants submit their entries. You are also able to collect emails for submissions. But if you partner up with a blogger, those email entries will most likely go to the blogger unless you specify in the giveaway rules that the participant needs to go to your website and sign up to the email list. However, the more steps you make them take, the less likely people will be to enter. If your site is new, getting entries to your giveaway might be tricky, since you don’t have a lot of traffic. But don’t worry, I’ll talk about the ways to get the most entries even without a lot of traffic later on in the post. The great thing about partnering up with a blogger is being able to use their existing audience. This works especially well if you’re just getting started and don’t have as much built-in traffic to your own website. This will drive new users to your site. The giveaway post will also stay on their website for as long as the website is live, meaning you’ll always get a stream of traffic from them. However, bloggers usually require you compensate them for the giveaway post, and the compensation depends on how big of an audience they have. Bear this in mind when you reach out to bloggers. 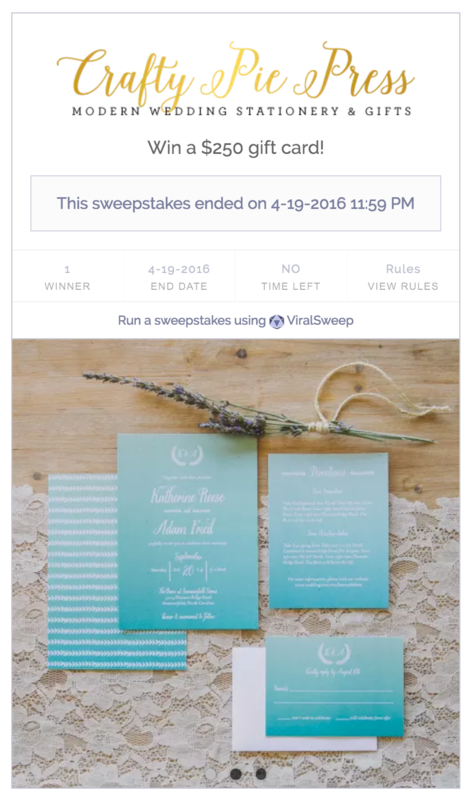 I’ve used Viral Sweep on a number of giveaways and I really like how easy it is to set up, especially if you’re not techy or design savvy. It’s free to sign up, so you can get a contest up and running quickly. They integrate well with most website platforms like WordPress or Shopify. I also really like how they allow participants multiple entries by using their email address, sharing with a friend, and following your social media accounts. The downside to Viral Sweep is that the free account doesn’t give you any of the email entries. You need to sign up for a paid account to access that information. But you can get a contest set up for free, pay when you want to get the emails, and then cancel your account. King Sumo is another great app for hosting a giveaway, and it allows you to capture email addresses with the entries. King Sumo is paid, but unlike Viral Sweep, which has a monthly subscription fee, King Sumo only has a one-time fee. The downside to King Sumo is that it’s for WordPress websites only. Rafflecopter is another popular app for hosting a giveaway. They also have a free version with limitations, but they allow you to export the email entries with a CSV file that you can then import into your email marketing software. However, they don’t have any social sharing or refer-a-friend options with the free version. And then there’s the manual way of doing it. This is where you can have people sign up to your email list and/or leave a comment on a blog post or some other action. Then you put the number of entries into a free random number generator app on the web and have that pick your entry. Again, this is a very manual way of doing things so you don’t get any of the fancier features that you would get with a paid app. gives you a way of contacting the participant if they win. If you’re using one of the apps listed above, you can have them do optional bonus entries like sharing on Facebook or referring to a friend. Now, we can’t talk about hosting a giveaway without talking about a prize. The prize needs to be relevant to what you’re selling, like a gift certificate to your online store or one of your products. Don’t just give away an iPad if you don’t sell iPads. This will bring the wrong sort of people to your online store, who will never buy anything from you. They just want the free prize. Also bear in mind that if the prize isn’t worth much, people won’t bother to try to win it. If it’s just a $5 gift certificate, you’re going to come off as cheap and like you don’t care about your customers. The more the prize is worth, the more participants you’ll have because there will be more incentive for them to enter. Email your list and tell them all about it. Email influencers that might be interested in sharing with their audience. Make sure to post it on all of your social media accounts. If you’re using Instagram, use hashtags like #contest, #giveaway, #contestalert, #contestentry, #competition, etc. List it on giveaway Facebook groups. Just go to Facebook, click on Groups and search for giveaway groups. Once your giveaway has ended, you’ll want to use those emails you collected by sending them a follow-up email letting them know they didn’t win. Give them a coupon code that they need to use in 24 or 48 hours as an incentive to get them to buy from your store. This is a win-win, because the people that lost the giveaway still feel like they got some sort of prize and then if they use the coupon code, you come away with additional sales. Do you have any tips to share for hosting a giveaway? Please leave a comment. I’d love to hear them!